Last year around this time, I sat down and took a few moments to reflect on 2015, and how I thought the social enterprise ecosystem would evolve and transform in 2016. As every ecosystem shifts and adapts with the seasons, so to has the landscape of social enterprise continued it path of change; we are in a much different place than we were 12 months ago. Here’s my thoughts for how the world of social enterprise will look in 2017. A greater emphasis on social enterprises with fully integrated impact and profitability. In the past, one of the easier social enterprise business models to wrap our heads around was a supportive or an independent business model. That is, a model where the social enterprise “profit center” wasn’t necessarily directly tied to the delivery and/or success of the social or environmental mission. Part of the reason for this was that existing charities or non-profit organizations already had systems and processes for creating impact. So, naturally one way to build a socially entrepreneurial approach into these existing infrastructures was to simply come up with a separate business that could generate profits on its own and funnel that money back into the charity or the non-profit. These initiatives are often related, and hopefully built directly off core competencies of the organization, but the “profit generating” activities remained non-essential to the cause. Now that more people are practicing and experimenting with social entrepreneurship, we realize how much stronger fully-integrated social enterprise models are. Stronger in both creating meaningful impact, and also in building a financially sustainable organization. The reason being, in an in integrated model, every time you put effort into growing the “business” side of the social enterprise, you are at the same time reinforcing and improving the impact side too. 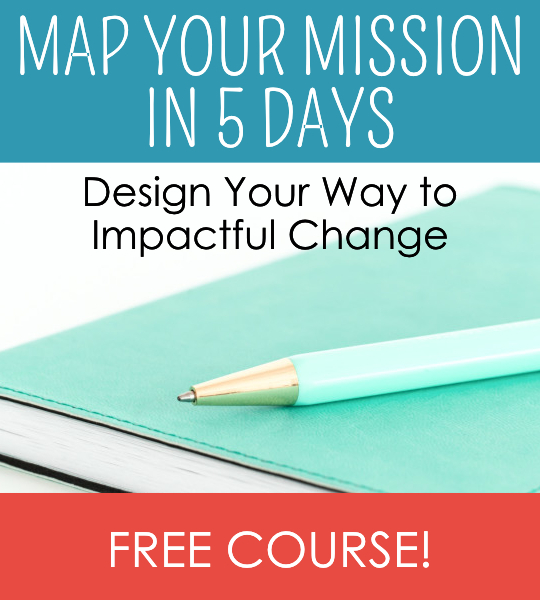 And vice-versa – every time you work to improve your impact, you automatically improve the profitability and overall health of the social enterprise. Because they both depend on each other, when one improves, the other follows suit. The big pay off for this is that you can expend less effort overall and achieve much greater results on both sides of the coin. So my prediction for 2017 is that independent social enterprises will still have their place but, for new social enterprises especially, there will be a greater focus on and challenge to everyone to develop social enterprises where impact and profitability are fully integrated with each other. More mentorship and coaching relationships for aspiring and new social entrepreneurs. As the conversation around social enterprise continues to grow in the mainstream, and explode within certain pockets of the community, the possibility of taking a socially entrepreneurial approach (rather than start up a traditional business) is a real option for aspiring entrepreneurs. Thanks to this, there are more people are starting new social enterprises and existing initiatives are receiving more support and recognition from the broader community. With these shining stars finally gaining wider recognition of their progress, and newbies in need of experienced mentorship to get new initiatives off the ground, it’s a natural fit. These mentorship and coaching relationships will offer the avenue needed to pass on the wealth of knowledge of experienced social entrepreneurs – who have been busy making things work and proving new models for years now – to the new social entrepreneurs seeking insight and guidance. More formal opportunities to be supported as a social entrepreneur. More than ever, there are new accelerators, incubators, courses, programs and services popping up all over the place to specifically support social entrepreneurs. Where before the available information felt limited to sparse government web pages outlining the difference between social enterprise and charity, now community-driven organizations are stepping in to fill the knowledge gap. Even mainstream corporations are realizing this movement is here to stay, and are investing time and money into supporting social entrepreneurs in a big way. For example, in my city of Calgary, Alberta, Canada, two of our five national mainstream banks have declared their support for social entrepreneurs and have sponsored local incubator programs. Related, the increase in social entrepreneurship programs through the traditional post-secondary education system continues to grow. More dialogue around and practice of impact investing. 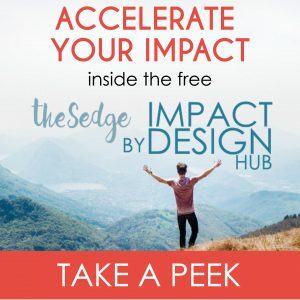 Again with increasing frequency of entrepreneurs choosing to implement an impact-first or purpose-driven model to create change in a sustainable way, the discussion around financing these innovative businesses will grow. Not every social enterprise can bootstrap its way in the early years. In 2017 I think there will be more traditional investors considering investing in social enterprises and recognizing the value they deliver over and above financial returns. The investors who have been practicing impact investing already will become more vocal about what they know, and help newly interested investors learn the ropes. Questions like: what’s working, what needs to be addressed in due diligence, what types of social enterprises are best suited for impact investing, and how can we grow the knowledge base in this area? Also, as the first wave of Millennials / Generation Y become more established in their careers, their disposable income is increasing. This generation has been perhaps the first wave of young people who have this idea of social entrepreneurship integrated in their frame of mind as a natural possibility, which is much different from older generations who grew up with the notion of very separate charitable, government, and business sectors. With social enterprise blurring these lines, and with this extra disposable income available to Millennials, they will start to look for purpose-driven ways to invest their money. They will be more open to the idea of impact investing and will be looking for opportunities to support organizations that generate not only a financial return, but that will also benefit society as a whole. Social Enterprise supporters will arrive finally accept a common language. In the past, those who studied or supported social entrepreneurs had a never-ending debate about definitions and categories within social entrepreneurship. I still see this happening, but I’m also seeing more of these folks asking for clarity and reminding each other how important it is for us to promote common terminology. For example, recently I had the pleasure of sitting at the table with several supporters and champions of social entrepreneurship. At one point, it was pointed out that some terms were being used in ways that could be misleading depending how they related to social enterprise as a whole, and who was listening. The time was taken to pause and clarify the language we were using – without going down a debate rabbit hole – but making sure we were all on the same page. In 2017, I think there will be more ‘getting on the same page’ as it related to terminology and language in this space. Phew – I’ll be glad for that! There you have it – my predictions for how the world of social enterprise will continue to grow and evolve over the next year. What do YOU think? 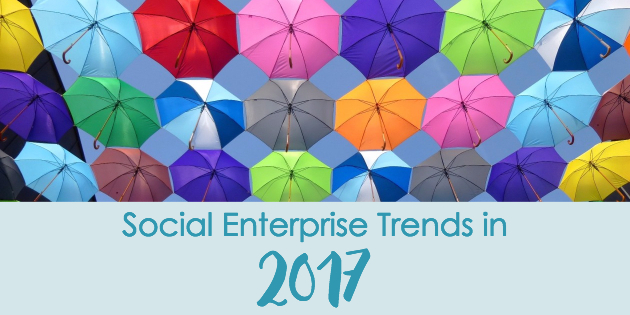 What are your predictions for social enterprise in 2017? Let me know in the comments! Related: Read Social Enterprise Trends in 2016. Great inspiration for all of us who believe that social entrepreneurship is not a passing fashion, not a semantic twist on cool words but a new paradigm for a new way of bringing change and meaning in the world! I personally am very drawn to this statement: ” More mentorship and coaching relationships for aspiring and new social entrepreneurs.” As a veteran business-entrepreneur- career coach of over 13 years, I very much long for the day that I will be working mostly if not totally with many wonderful social entrepreneurs with important messages and initiatives for our world! Great post and its handy to see the current trends condensed into a clear format. We’ve seen similar trends emerging, particular amongst our millennial participants who have quit their jobs to find more meaning in their lives and careers. After completing our social enterprise programmes many have gone on to launch new careers in social enterprise, social impact investment as well as with support organisations in the space. When we started _SocialStarters in 2014 we really felt like we were pioneering something and now 3 years on it’s clear that a career in social enterprise or more mission-led business, is certainly not a passing phase or the hundreds of applicants we’ve seen.